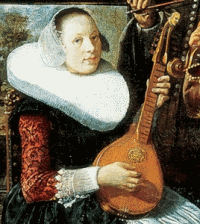 The cittern was arguably the most important — and certainly the most popular — renaissance instrument after the lute. Like the earlier gittern, the cittern had a place in everyone's heart, no matter what their social standing. If the lute was mainly for the moneyed class and those serving them, the cittern was the instrument of choice for the common folk. The cittern (also cittharn and various other spellings, as English spelling had not yet been standardised) first appeared in England in the 1540s. It was small (though it soon appeared in a variety of sizes) and its four courses were played with a plectrum of quill, shell or bone. Its strings were made of “wire”, meaning iron and twisted brass which, together with its very narrow body, made it amazingly loud for its size. The first course was two strings in unison, as was the second. The third and fourth courses also could be, but could also be three strings, with one string tuned at the lower pitch you’d expect and two strings tuned an octave higher (see illustration below). The cittern was tuned in a way that may seem odd to modern string players. It had re-entrant tuning, meaning that one course was out of the usual low-to-high pitch sequence. To be exact, the fourth course was tuned higher than the third course, so the third course had to ‘re-enter’ the usual sequence (see illustration of Italian and French cittern tuning). A small number of well-connected composers more known for their solo lute pieces, such as Anthony Holborne, composed complex and demanding music for the solo cittern. And it was used in the Elizabethan broken consort, a small group of different instruments playing together, typically lute, cittern, bandora, viol, bass viol and recorder or flute. But its main favour and popularity was among the great mass of people. It was so popular and widespread that from the late 1580s you would typically find one hanging on the wall of your barber shop. Your barber was also your dentist and surgeon, hence the red and white striped pole for blood and bandages. Citterns were even made with a hook on the back for ease of hanging on the barber's wall. It is easy to imagine someone buying their broadside ballad from a ballad-monger in the street, then going off to the barber to have a haircut or a tooth removed, taking the cittern from the wall to work out an accompaniment for the ballad while he or she waited. It’s certainly a better idea for your waiting room than three year old Good Housekeeping magazines. It remained popular well into the 18th century, gaining more courses and a variety of other tunings over time. There is a modern five course folk instrument called the cittern, created by Stefan Sobell in 1973. The renaissance cittern is not the same instrument, of course, but it is the instrument Mr. Sobell saw in a book which gave him the name he 'borrowed' for his new invention.